Oh wow, it’s bad enough that this happened, but for the police to refuse to do anything about it! 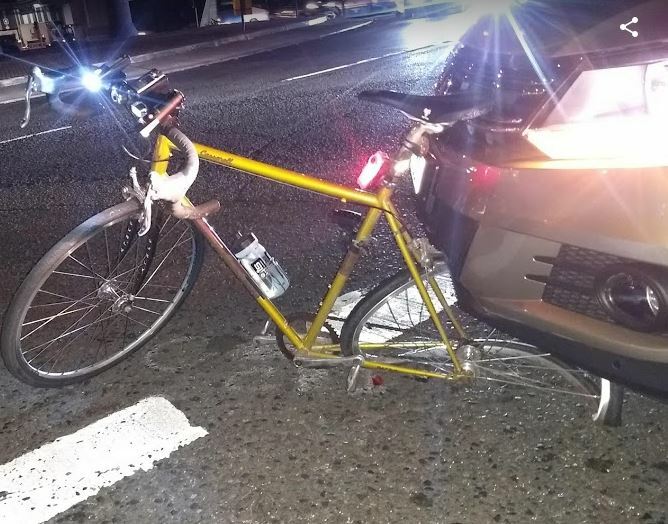 Have you thought of contacting Bicycle NSW for assistance with this? Wow – There is nothing worse that the divide between cyclists and drivers – we are all the same people, just trying to get somewhere. Glad you are OK. I wouldn’t stop hasseling the police. Get the inspector or the senior officer on station. Ultimately you can complain to the Law Enforcement Conduct Commission if they don’t do what we pay them to do. I hope you got the drivers details so you can make him pay for the damage. On a different note can the bike be resurrected? It looks like he destroyed your wheel but not the frame – or did he? Personally I wouldn’t stop riding because of this. I would also not stop recommending cycling in Sydney. This will lead to people giving up and giving the Alan Jones’s/Harold Scruby’s/NRMAs the victory they so crave. Dan, this is terrible. Google NSW police manual. From memory, it’s at around page 496 or so, it says that police WILL SERIOUSLY INVESTIGATE a crash when you are willing to give a statement and willing to go to court as a witness if necessary. These are the magic words to use, “I want to make a statement and I’m willing to go to court”. Take a copy of the page with the police manual with you just in case they still resist. Then escalate to the Local Area Commander. This is in no way acceptable. Dan, any updates to this situation and your experience with making a statement to police? It’s not acceptable that they refuse to take a statement. I don’t even understand how they can. You can make statements for the most minor things if only for insurance. This is much more serious. Totally disgusting. Makes me ashamed to call myself an Australian, if this is the attitude of the police, and the general public. Wow ….. shocking. This will start to make me look more often behind me. Hope you re ok mate. You were they one that made me start riding in Sydney.